PINES Wheat Grass Powder is convenient, surprisingly economical way to make sure you eat green vegetables every day! It can be challenging getting kids to eat enough dark leafy greens. Heck, it can be challenging for many adults. My kids love green smoothies and spinach salads, but we don’t have them every day. There is an easy solution to getting the high nutrients from dark, leafy vegetables…[amazon_link id=”B000M4E7Z8″ target=”_blank” ]Pines International – Wheat Grass Powder[/amazon_link]! Pines International has been making wheat grass products for 35 years! That’s long before it became trendy to get a shot a juice bar. Like many people, I assume that fresh juice is better than consuming a powder; however, I learned a lot when researching this product about the negative side of growing wheat grass in trays versus growing it naturally outdoors. Differences in soil conditions, growing time and environment lead to significant differences in nutritional content. 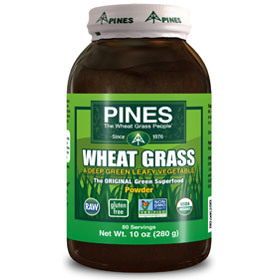 PINES Wheat Grass is much more nutritionally concentrated and complete than fresh wheatgrass juice. Click here for a nutritional comparison. Because PINES Wheat Grass is grown as nature intended through cold months, outdoors in temperatures that are often freezing at night, it can grow slowly as nature intended. That results in a naturally concentrated, dark green leafy vegetable that provides a wide array of vitamins, minerals, antioxidants, and more, which are too numerous to be shown in our nutritional analysis. Greenhouse or tray grown wheatgrass juice, while highly regarded by many, simply is not given the time to develop fully, and can’t compare nutritionally with wheatgrass grown the way nature intended. It is grown far too quickly, and instead of seeds being an inch or so apart as is natural to wheatgrass, the seeds are placed right next to each other, making it impossible for the plant to develop properly. These crowded conditions as well as unnaturally warm temperatures and humidity leads to mold and bacteria that can make the juice often taste bad and can lead some people to stomach upset. I’ve experienced that rush of nausea from a shot of wheatgrass juice and assumed it was detoxification. Actually, the reason for nausea in some people is more likely caused by the high sugar content combined with the toxicity of the bacteria and mold that accompanies wheatgrass grown in unnatural conditions, not detoxification by the wheatgrass. Commercial tray wheatgrass growers and suppliers as well a proponents of growing it in one’s own kitchen often play down the mold and bacteria in tray wheatgrass, claiming it is not harmful and is simply caused by spores and bacteria on seeds that do not germinate, and for many people, especially when they get used to it, the mold and higher bacteria levels of tray-grown wheatgrass do not cause a problem. Although they are not receiving as much green food nutrition as they would receive with wholefood wheatgrass grown naturally like Pines Wheat Grass, the green food nutrients in tray grown wheatgrass are definitely something that most people need more of in their diets. The wheat grass grown for Pine products is cultivated on land that has been used for organic farming for 20 years! Thanks for the product information. Will try it this time.